The McKinley Park branch of the Chicago Public Library serves the McKinley Park neighborhood and surrounding communities with library services, events and amenities from our building and reading garden at West 35th Street and South Wolcott Avenue. 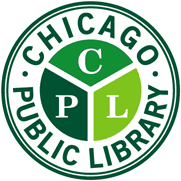 Connect with the library by visiting at 1915 W. 35th St., accessing our website, calling (312) 747-6082, emailing mckinleypark@chipublib.org or attending one of our many events. The McKinley Park public library is a nexus of activities for library patrons, library events and support for the community, serving the McKinley Park neighborhood and surrounding areas from its home at 1915 W. 35th St. in Chicago. Library features include Chinese-language materials, Spanish-language materials, a citizenship corner and homework help. Noon - 8 p.m. Mon. and Wed., 10 a.m. - 6 p.m. Tues. and Thurs., 9 a.m. - 5 p.m. Fri. and Sat. Amenities include WiFi, computers, meeting rooms, parking lot, scanner, bike racks and an after-hours book return.